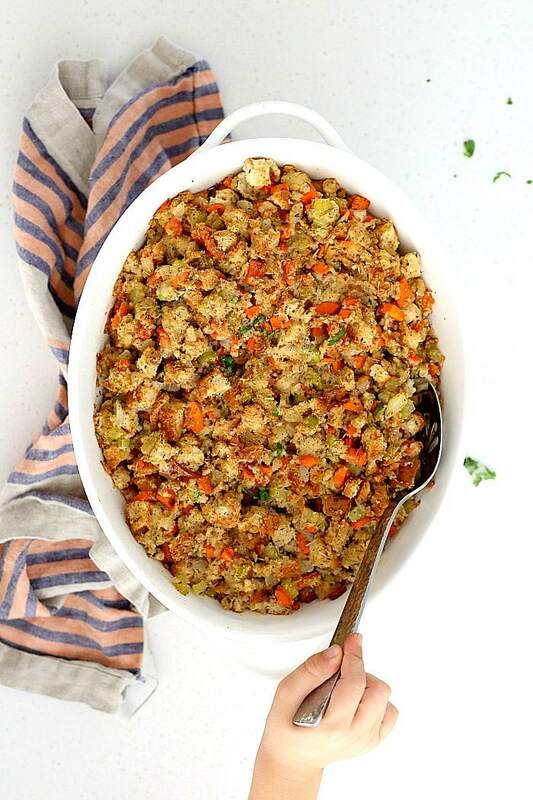 This gluten free stuffing recipe is the BEST comfort food for the holidays! Gluten free stuffing is simple to make with rich flavorful herbs, vegetables and gluten-free bread. 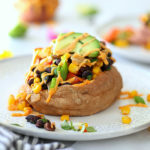 It is plant-based with a vegan option or stuffed in a turkey for meat lovers! It is holiday time and I couldn’t be more excited to be sharing my gluten free stuffing recipe with you than now! I have been making gluten-free stuffing every holiday for the past 14+ years. Tried and true… always delicious and never disappoints! 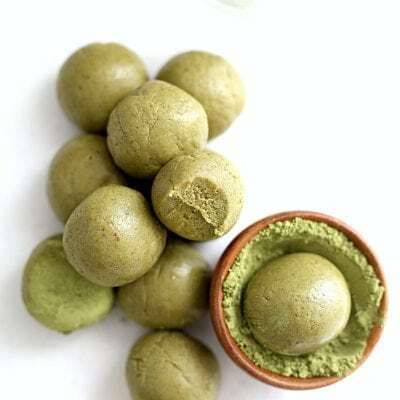 This recipe is one that is requested over and over again every year! Since I am working through adding to the blog all the comforting holiday foods we make such as – garlic mashed potatoes infused with sage butter, homemade cranberry sauce, pumpkin hummus, pumpkin butter – it is time for a fabulous stuffing recipe! 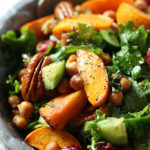 I hope you make all these delicious foods this year! For Thanksgiving and Christmas, we either fly to visit my mom in Virginia or switch off spending with my in-laws. My sister-in-law always requests that I am in charge of the stuffing. My mom gave me a stuffing recipe years ago that I cannot seem to find the original recipe because now I make it on autopilot? from memory. After about 14 years of the same delicious recipe, you kinda just remember it. She always added carrots to stuffing, which I appreciate the extra dose of vegetables in a bread-heavy side dish! The only difference is my mom would bake it in the turkey, which gives stuffing a very moist consistency from the juices of the meat. My version, I sauté the vegetables on the stove with diced gluten-free bread (instead of regular bread) then simply bake it in a casserole dish. 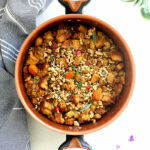 Since our feasts are usually potluck-style, and someone else is preparing and baking the turkey (other than myself), baking stuffing it in the oven is a convenient way to make this side dish ahead of time. This gluten free stuffing can be made a day in advance and reheated right before Thanksgiving if you need. 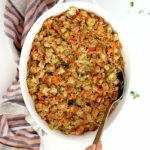 This is the BEST stuffing recipe made with no animal fats (but I am sharing that option baked in a turkey) and it is of course…healthy! 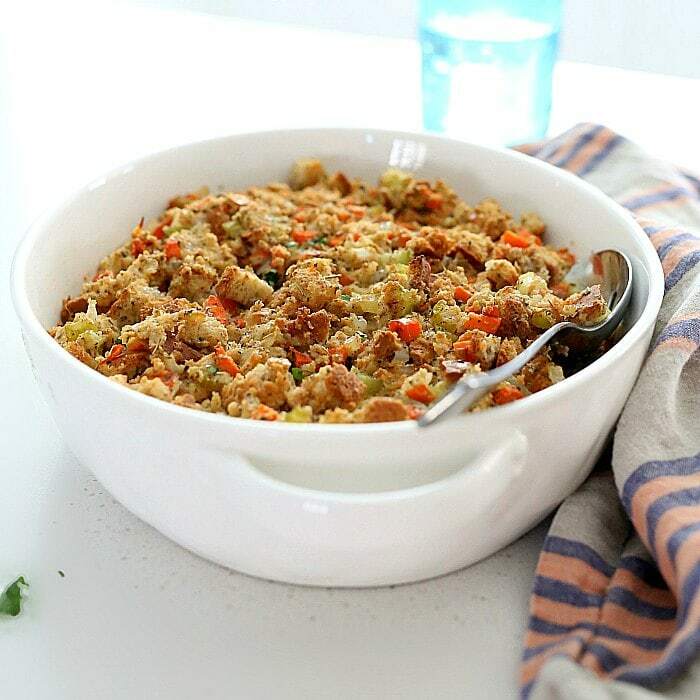 What makes this gluten free stuffing recipe healthy? The ingredients, which are a gluten-free bread loaf (or this vegan, dairy-free, egg free gluten-free bread loaf), celery, onions, carrots (yay for extra veggies!! 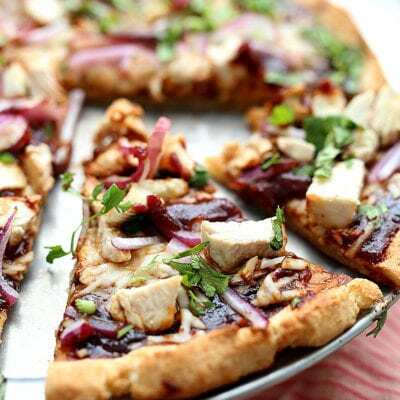 ), water, lots of flavorful seasonings and herbs, and a drizzle of olive oil on top after baking – if you want. What gluten-free bread should I use in stuffing? 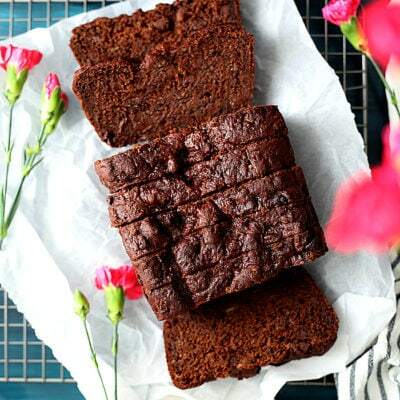 I like to use my homemade gluten-free bread recipe for a real authentic homemade gluten-free stuffing recipe, and for convenience Udi’s Gluten-Free loaf and Little Northern Bakehouse have delicious breads. One thing I have learned about gluten-free bread is to be careful on which you choose because to make them taste good and fluffy they are sometimes filled with extra salt sugar and fats. If you ever have a question about any breads, send me an email through my contact page and I am happy to answer your questions. On the stovetop then baked in the oven. To make gluten-free stuffing on the stove is easy! Simply sauté the vegetables in olive oil or avocado oil for about 10 minutes. Then add the herbs and seasonings, broth, apple cider vinegar and gluten-free bread loaf (chopped into small cubes). Mix it then transfer it to a baking dish. Bake it for about 50-60 minutes until the top is slightly crisp and browned. Stuffed in a turkey and cooked with the turkey juices. This method is much more moist and my mothers favorite way to make stuffing! Start making the stuffing the same way you do the first method. Saute the vegetables on the stove then add the broth, apple cider vinegar, seasonings and gluten-free bread. Mix well then add it to a turkey stuffing bag for easy removal when it is finished baking. Bake according to turkey pounds and directions. This gluten free stuffing recipe can be made a day ahead of time and lasts about 4 days until its a no-no. Cover and reheat it in the oven at 350 degrees F or until warmed in the center. If you cook it ahead of time wait to add the oil on top until right before serving. I like to add that little drizzle for a little more flava! but you can leave it out if you want to save your calories for dessert?. 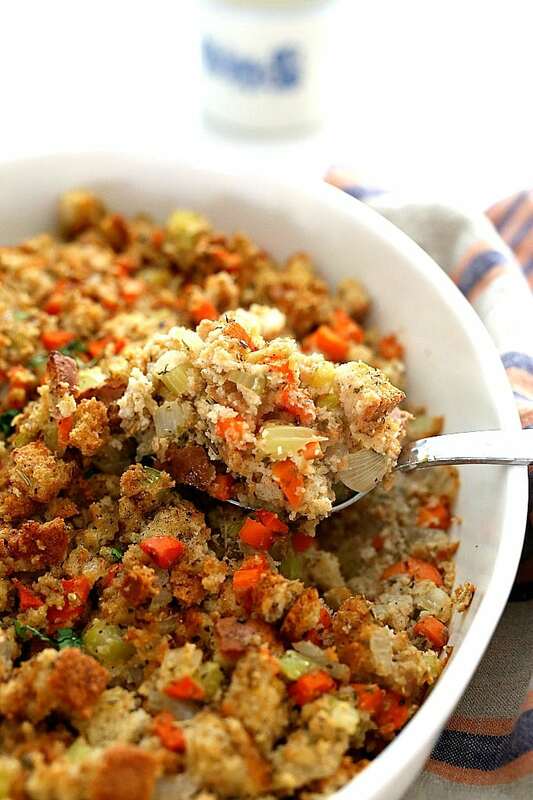 This gluten-free stuffing recipe is the BEST comfort food for the holidays! Gluten-free stuffing is simple to make with rich flavorful herbs, vegetables and gluten-free bread. It is plant-based and can be made vegan or stuffed in a turkey for meat lovers! Preheat the oven to 350 degrees F. Prepare a 9x13 baking dish (or oval dish) by spraying it with cooking spray. 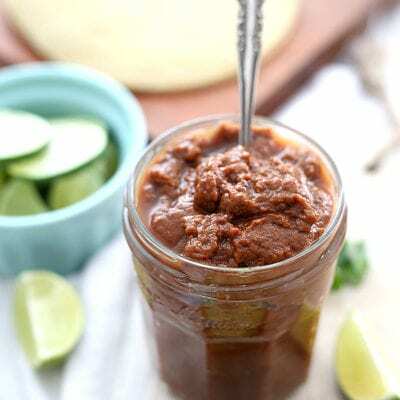 In a saucepan add 2 tablespoons of olive oil (or avocado oil), diced carrots, diced onions, and diced celery. Saute on medium-high for about 10 minutes until tender. Add 2 cups of broth, apple cider vinegar and poultry seasoning. Mix to combine. Add the gluten-free bread cubes. Mix well then transfer to the prepared baking dish. Bake for 50-60 minutes until the top is slightly browned. 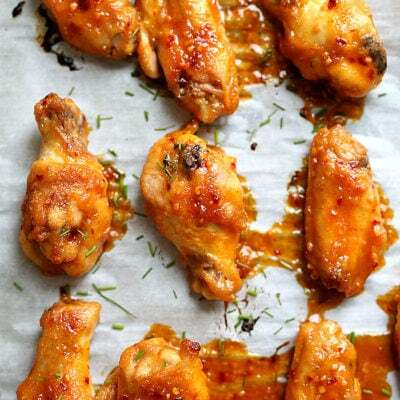 Optional to drizzle a bit of olive oil or avocado oil on top right before serving. If you want to bake the stuffing in a turkey, skip adding it to a casserole dish. After sauteing, add the sauteed stuffing to a turkey stuffing bag. Place the bag in the turkey and bake according to the turkey directions and stuffing bag directions. Can add chopped parsley on top right before serving for pops of color. Add salt to taste at serving.